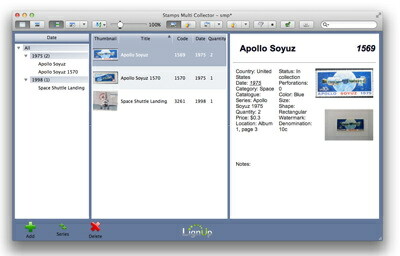 LignUp Stamps Multi Collector (Stamps MC) is a great starting tool for managing your stamp collections. It has a user-friendly interface that's easily navigated and comes with lots of additional functions that go well beyond those required by a typical stamp collector. Stamps MC is able to support several databases to which you can add tags for date filtering to make the sorting process easier. With Stamps MC's separate views feature, users can customize their databases into a variety of layouts to make them easier to work with. The tree function and the table list function make the sorting of these layouts exponentially easier and faster. Once you have your items categorized and tagged for easy navigation, Stamps MC can search your collections by name or number and then allows you to add them to your layouts in just one click. The internal camera capture function allows for taking screen shots of your stamps, which can be cropped and fine tuned for easy placement within the layout of the collection template pages. 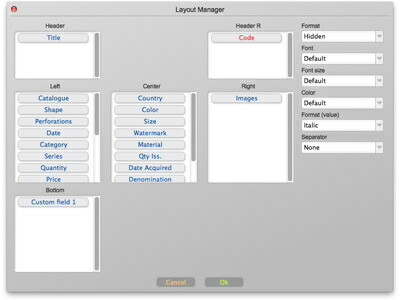 These pages can be created from the predefined layouts within the program. 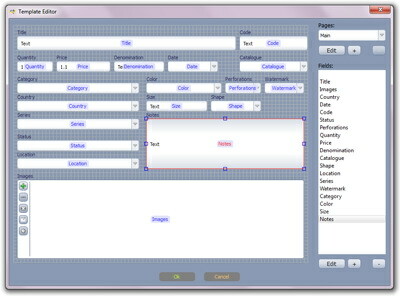 Everything about the templates is completely customizable via the template editor. All templates come with the ability to add additional fields for inputting information and formulas, the option to back up your data and add password protection as well. Stamps MC's template editor also supports the importing and exporting of data for those needing to create more advanced templates. If you already use Excel or other .CSV-compatible software for collecting, Stamps MC also has a CSV import features that will allow you to easily move your collection to Stamps MC. There are some drawbacks to the Stamps MC program, however. It lacks detailed documentation during the reviewing process and also lacks some sorely needed functions like statistical views customizations. You can try the Stamps MC program for free via a trial download. The FREE version is good for viewing and entering data and can be used with a free Dropbox account and be synced with many computers at once. The free version is pretty function, as far as trials go, and allows you to do much of the same things as the paid versions do. If you decide to go with a paid version, you have a choice between the Professional Version of Stamps MC or the Ultimate Version of Stamps MC. Comparing with other popular vendors, the Professional Version's functionality is much better and costs less. It contains powerful modules that other companies try to sell as external add-ons. 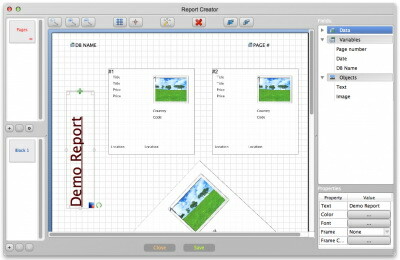 Its 'Advanced Report Editor' is like an additional graphical report creator that would sell for up to $100 as a standalone app if purchased separately. If you want to put the Professional Version of Stamps MC on two computers, you can do that for a discounted price, which includes a bundle of the collecting programs for each computer - stamps, books, inventory apps + stamp identification software. 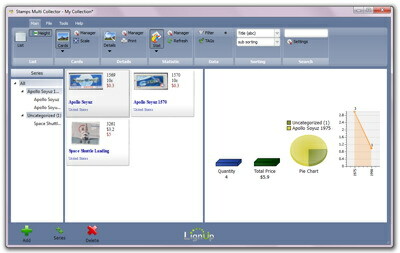 LignUp provides1 year of free updates for purchased versions and are busy releasing new features all the time. Their support staff is friendly, knowledgeable and helpful as well. In my opinion, no other stamp collecting software can compare with Stamps Multi Collector's functionality at such an affordable price. Users who download the free trial will recognize that to get even close to the functionality of the Stamps MC program, you would have to purchase several different apps at $30-$70 a pop if using similar programs. All things considered, Stamps MC is definitely worth the investment, whether you are a seasoned stamp collector or just starting out.